Sekonic created a great new light meter. It basically updates the Sekonic L-308s with new features aimed at filmmakers using DSLR and hybrid cameras. Sekonic calls this DigiCine or Digital Cinema. In other words, they've added a cool new HD Cine Mode. But the instruction manual ... is not so great. And it shipped with a typo, even. 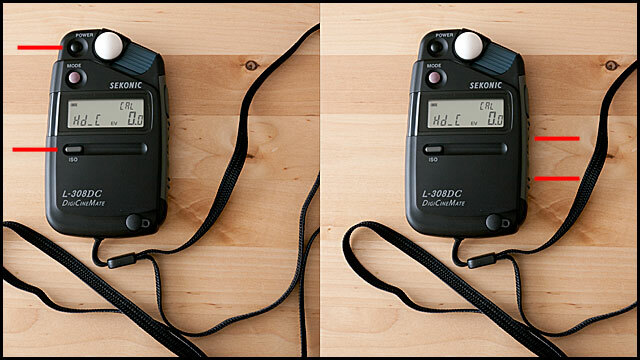 So, here's how you calibrate the Sekonic DigiCineMate L-308DC (DigiCine) meter. 1. Turn the meter off. 2. Hold down the ISO button and the Power button (these are marked with red lines on the left side of the photo above). 3. Now the meter will start, and you'll see it say "CAL" and "0.0" in the display. 4. Adjust the amount you want to calibrate the meter using the buttons on the right side of the unit (these are marked with red lines on the right side of the photo above). 5. Now, turn the meter off by pressing the Power button. 6. Wait 6 seconds, just because. Now, when you turn the meter on again it will be calibrated as you've set it. What does "Adjust the amount you want to calibrate the meter" mean? When I calibrate electronic measuring instruments, I need a standard source; a known signal. Wouldn't you need some kind of standard illumination source to calibrate a light meeter? Generally calibration involves changing the slope and offset, assuming a straight line model. I guess I'd have to know more the instrument. You are correct -- we can calibrate to standard sources. I'll post a longer "how to" sometimes in the upcoming weeks (just wanted to get that online -- since the manual has a typo). But here's what I was going for: my goal was to make the meter match my in-camera meter when used with a grey card. The Sekonic was 1/3 of a stop different from the in-camera meter when metering from a grey card. That's fine, and actually probably Sekonic did it on purpose. But I really wanted to be able to use the Sekonic for a quick reading and trust that I would get the same result as if I pulled out a grey card and metered from that. So, my goal was: adjust the Sekonic. So, I set the Sekonic to a +1/3 of a stop. Now, if I walk into a room, put the Sekonic where my subject's chin will be -- pointed toward where the camera will be -- the reading I get should be right on. It makes it a very quick first step (and we can confirm a test shot to be certain). So, in this case, the goal was: make the Sekonic "represent" what the meter in the camera would detect. I hope that makes sense -- I will post a video as soon as I find some time.